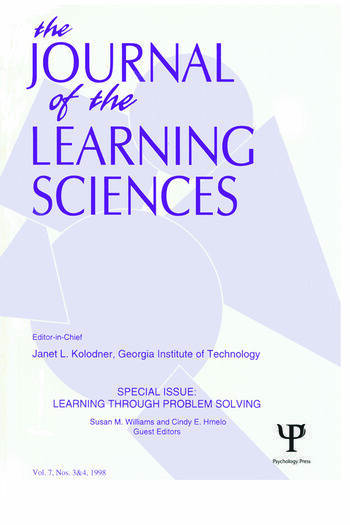 The articles in this special issue represent the findings of researchers working in classroom settings to explore key issues in learning through problem solving. Although they vary in the domains being studied, the age of students, and the methods they employ, there are numerous common themes that can inform both theory and practice. The authors have grappled with the complex task of putting problem-based curricula into practice. They report here the difficulties they faced, the factors contributing to their successes, and the lessons they have learned. Contents: S.M. Williams, C.E. Hmelo, Introduction: Learning Through Problem Solving. Articles: B.J.S. Barron, D.L. Schwartz, N.J. Vye, A. Moore, A. Petrosino, L. Zech, J.D. Bransford, The Cognition and Technology Group at Vanderbilt, Doing With Understanding: Lessons From Research on Problem and Project-Based Learning. J. Krajcik, P.C. Blumenfeld, R.W. Marx, K.M. Bass, J. Fredrics, E. Soloway, Inquiry in Project-Based Science Classrooms: Initial Attempts by Middle School Students. J. Erickson, R. Lehrer, The Evolution of Critical Standards as Students Design Hypermedia Documents. E.B. Coleman, Using Explanatory Knowledge During Collaborative Problem Solving in Science. D.E. Penner, R. Lehrer, L. Schauble, From Physical Models to Biomechanics: A Design-Based Modeling Approach.